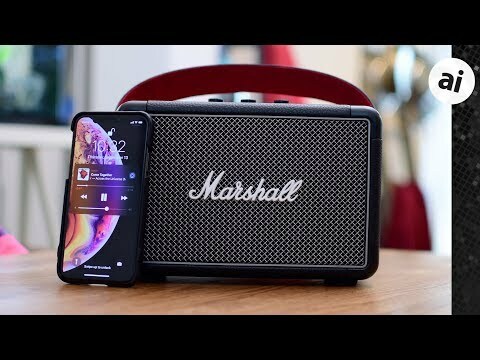 Consumers have been snapping up home speakers, which is no wonder Marshall has continued to expand their speaker lineup. 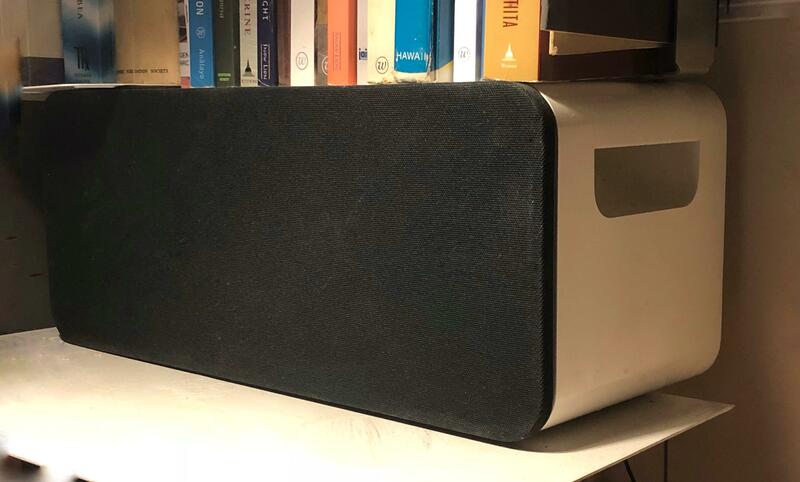 What launched as a core lineup of wired Bluetooth speakers, now includes many Wi-Fi AirPlay and portable options as well. Kilburn has been one of the more popular with powerful sound, a vintage design, and a lower price tag. The second incarnation adopts a more robust design and improves the specs for a fantastic portable speaker. The exterior looks the same at a glance, but further inspection shows how many things have been updated. Behind the script "Marshall" wordmark gracing the front is a new metal grille instead of woven fabric it had before. Most of the gold accents present on the last generation has been shunned, leading to a slightly more modern appearance, while sitll looking retro. Each of the corners is reinforced for added drop protection, but even more important is the new water resistance. It has IPX2 resistance, which isn't anything crazy, but will handle a few drops of water if it happens to be poolside or a few drops of rain start to come down. Again, this is protection against a few drops of water, not splashes or submersion but still useful for a portable speaker. On top is a trio of manual control knobs to adjust the volume, bass, and treble. Marshall has an iconic sound, and adjusting these knobs doesn't stray too far off that mark, but it still enjoyable to dial in the sound to your liking. Each of those knobs also has the tension set just right, they don't slide around loosely, they've the perfect amount of resistance when rotating with a tight tolerance that guarantees as you adjust the knob the audio balance will be tweaked. Living just to the right of the tuning knobs is an LED panel. As the speaker is turned on, the lights will turn on to represent the remaining battery. It has a nice animation to go with, just giving it a bit more of a premium feel. A power toggle is built into the first knob -- the volume one -- so when the volume is all the way down it shuts off. There's a small button all the way to the left that you can use to jump between multiple Bluetooth devices as well as to enter pairing mode. On the back of the Kilburn II, you will find both a power cable port as well as an auxiliary audio input. A plush strap makes its way across the top for comfortable portability. It can be removed from the metal anchors if it isn't desired. Red velvet material is hidden underneath which acts as a bold accent color to the otherwise black body. Tucked away behind that metal grille is a powerful set of speakers. A 20W Class D amp acts as the woofer, with two 8W tweeters to back it up. Multiple hosts can connect to the Kilburn II over Bluetooth 5.0, and supports AptX for better quality audio. Still, iPhones and iPads don't support AptX, with Apple pushing people towards their proprietary AirPlay protocol instead. Bluetooth 5 gets solid range, easily supporting about 30 feet without issue in our playback tests. Battery life on the Kilburn II is amazing. Depending on volume, it can last over 20 hours. Keeping the volume to about the middle range, we were able to that mark in our testing. With such a long battery, we were worried about charging times, but Marshall has built-in quick charging capabilities. Just 20 minutes of being plugged in will keep your tunes cranking for three hours. Leave it plugged in for two and a half hours to top the battery off. As we mentioned, Marshall has a distinct sound profile. One that is tuned with rock and roll in mind. Other genres still sound good, but they come secondary to rock. There is definitely a grittiness to the tone that lends itself well to these categories. The Kilburn II has a solid and clear midrange with clear highs. Bass was powerful, though relatively clear. We did notice some muddiness as we cranked the volume up in the low end, but surprisingly even at max volume, the Kilburn II gets its sound together without any distortion. We tested quite a few genres of music on the Kilburn II, and rap was the least impressive of the bunch. Marshall leans towards a full, rich sound that lends itself to guitar solos rather than the punchy beats of rap and hip-hop. Of course, we are getting into nitpick territory here. One of our favorite features was the support for multiple Bluetooth hosts. We were able to connect two devices at the same time and alternate between them. When taking this with us outside, it was such a unique way to have multiple people control playback at the same time. Kilburn II isn't the smallest portable speaker out there. Even in Marshall's lineup, the Stockwell is a smaller option. However, the larger size gets you impressively loud and great sounding audio and a phenomenal battery life. The new rugged design makes it a better choice than ever to take on the go, despite the size. Anyone who loves classic rock will appreciate the retro aesthetics that got a slight shift towards the modern this time around. Kilburn II is available to order now for $299. For those who don't need the tweaked design can still pick up the original model in cream or black for around $219. Thanks for the review. I was curious about the Kilburn. I've been using the Marshall Stanmore the last few years and I love it. I’d be interested if AppleInsider wanted to review the Apple HomePod compared to its earlier precedent, the IPod Hi-Fi. These are still available second hand, looking great and kicking out a very fine sound. I have one and it’s so good I’m not sure if I should trade up to the HomePod - even though there are obvious technical improvements (like Bluetooth). It’d be interesting reading! And would fit some of your other historical articles. Thanks for this review. I have the original Kilburn 1 and it is a fantastic speaker. It’s the perfect match for my iPhone. I love the retro looks too.